Nearly 25 years after the birth of the world wide web, most Americans have computers and internet access, but the nation remains a patchwork of connectivity, with some metro areas full of high-speed connections and other areas much less plugged in. That’s according to a Pew Research Center analysis of the Census Bureau’s first estimates of computer use and internet connections for local areas, released yesterday. For example, in the Boulder, Colo., metro area, more than eight-in-ten households not only have an internet connection, but it’s also an always-on, faster-than-dialup broadband subscription. In the Brownsville-Harlingen, Texas, metro area, though, only about half of households do. The bureau has previously published national and state data, but the new estimates from the 2013 American Community Survey add a vastly more detailed geographic dimension to analysis of online and offline Americans. Overall, 84% of U.S. households own a computer, and 73% of U.S. households have a computer with a broadband connection to the internet, the bureau reported. These findings are right in line with survey findings of the Pew Research Center, which found that 70% of Americans have broadband access. The new Census Bureau figures show wide variance by state and local area, though. In New Hampshire, Massachusetts and Utah, about eight-in-ten households have a broadband connection, according to the new data. In Mississippi, only 57% do. 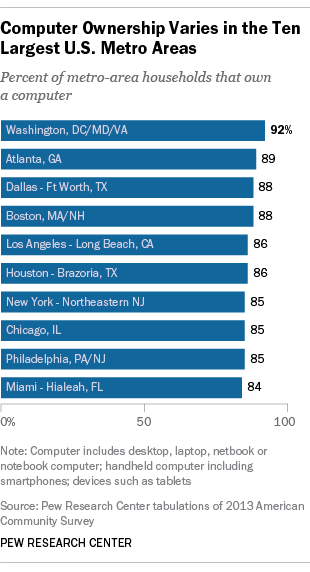 Among the 10 largest metro areas, the share ranges from 73% in Miami to 84% in Washington, D.C. Among the regions where the highest share of households have broadband connections are relatively small but college-heavy metro areas such as Boulder (85%) Lawrence, Kan. (83%) and State College, Pa. (81%). But broadband adoption rates are markedly lower in the metro areas of Brownsville-Harlingen, (53%) and Pine Bluff, Ark. (52%), where the share of college graduates is lower than the national average. Despite the rising popularity of smartphones and other mobile devices to access the internet, relatively few people rely exclusively on these devices for access to the internet—less than 6 million households, or about 5%. Again, this is something that Pew Research has documented, though our surveys have also found that about a third of those who use smartphones to go online mostly use their mobile device to connect, rather than a wired computer. At the opposite extreme, the census data find that nearly 25 million households (21%) have no regular internet access at all, either at home or elsewhere. Pew Research Center surveys employ a different metric, asking adults whether they use the internet; 87% say they do. The census estimates provide new confirmation that those with higher incomes and higher levels of education are more likely to be internet users. Among households with incomes below $20,000, most do not have an internet subscription for a computer, cell phone or other device, though they may have free access at a local library or elsewhere. Among households with incomes of $20,000 and higher, most households have their own broadband subscriptions. Still, even in college towns with a heavy presence of high-tech companies, there are some people who do not own computers of any kind—desktop, laptop, notebook, netbook, smartphone, tablet or other device. In Palo Alto, Calif.—in the heart of Silicon Valley and home of Stanford University—at least 4% of households do not own any type of computer. In Pasadena, Calif.—home of Cal Tech—at least 11% of homes don’t have computers. In Cambridge, Mass.—location of Harvard and M.I.T. —at least 8% of households are computer-free. These estimates have high margins of error, and the figures used here are the most conservative. The data released yesterday come from three new questions that the bureau added to the 2013 American Community Survey questionnaire of more than 2 million households. The new estimates are for geographic areas with populations of 65,000 people or more; later this year, the bureau is expected to release data for smaller areas, as well as its own analysis of the new data. In a briefing last week, Kirk Bowman, a bureau official, said the new data on internet access was required by congressional legislation.